At long last, after 35 years, Pres. Obama finally commuted the sentence of Oscar López Rivera. The president is to be commended for this. But for eight years, Obama misled the entire Puerto Rican community. He used them as a doormat. In the same week that Obama nominated Sonia Sotomayor to the US Supreme Court, he also nominated Robert Groves to direct the US Census. The hoopla surrounding Sonia’s nomination enabled Groves to sail through the US Senate confirmation hearings – virtually undetected – and abandon statistical sampling as the prevailing census methodology (see page 15 of the transcript). In other words, the appointment of Sotomayor served as a cover for the ultimate denial of hundreds of billions of federal dollars from Latino neighborhoods, and Latino school districts, all over the US. Obama did nothing to restore Chapter IX bankruptcy relief to Puerto Rico, which was arbitrarily withdrawn during the Reagan administration in 1984. Obama expended no political capital; issued no executive orders; offered no Treasury negotiations, Dept. of Commerce initiatives, or tax code incentives…nothing. He simply allowed Puerto Rico to melt down into insolvency. Instead of Chapter IX, Obama lobbied intensively for the passage of PROMESA, and the installation of a Financial Control Board over the entire island. Over the next few years, hundreds of thousands of retirees may lose their pensions. The minimum wage may go down to $5 per hour. Electrical rates will double. Schools and hospitals will close. “Public private partnerships” will swallow the public economy. Another million Puerto Ricans may be forced to leave the island…and hand it over to Wall Street operatives and US billionaires. THAT is Obama’s economic legacy for the people of Puerto Rico. The appointment of Sotomayor was cleverly timed, and served to cover the real action in the US Census. But beyond this, in 2016, Obama sent his Solicitor General to the Supreme Court…not once, but twice. In two landmark cases – Sanchez Valle and Franklin Trust – the Obama administration argued that Puerto Rico is a “territorial possession” of the US: with no political, economic, or juridical sovereignty whatsoever. 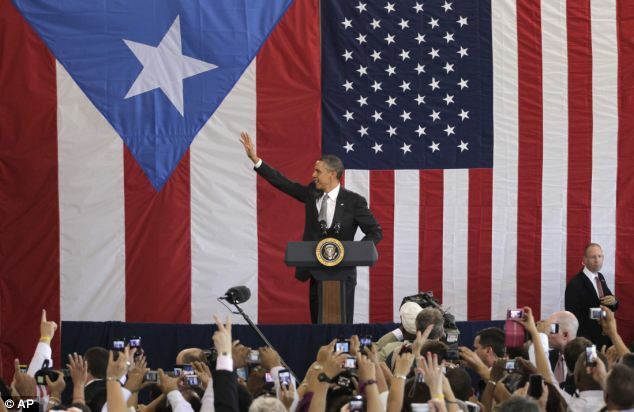 Obama made it clear – and the Supreme Court agreed – that Puerto Rico is a US colony. Barack Obama is a Harvard Law graduate, a masterful orator, and a talented politician. You don’t manage to become the first black POTUS without a strong skill set. Unfortunately, Obama applied none of his personal skills or presidential powers, on behalf of Puerto Rico. He commuted the sentence of a man who had already been pardoned twelve years ago, and should not have been in jail until January 2017…if at all. We certainly appreciate the release of Oscar López Rivera. We thank Obama for that. But for nine million Puerto Ricans, the Obama presidency was much ado about nothing. Lessons learned. Very pleased to hear of the release. Everyone stands to be forgiven, if only for a season. The island will continue it’s plight until lessons are learned. Before you can fix something it has to break. Sad fact of reality. Apparently the players are still causing havoc for the masses. Isn’t that yet another sad reality? What’s really needed is true leadership and not at the expense of the average person. If you can’t beat the system, well then join them and work from within. Some things never change. WHAT YOU REALLY MEAN IS: “SHOWMANSHIP?” RIGHT? REALLY?? WHAT FATE? HE’S GONE AS FAR AS ANY BLACK MAN HAS GONE IN U.S. POLITICAL HISTORY. YOU DON’T THINK HE FACED AND CONQUERED THOSE CHALLENGES ON THE WAY THERE? THERE ARE NO MORE OF THOSE “CHALLENGES” LEFT FOR HIM NOW. WHEN PEOPLE REACH A CERTAIN SOCIO-ECONOMIC STATURE IN OUR SOCIETY, WHAT YOU’RE REFERRING TO DOESN’T MATTER ANYMORE. THE ONLY REAL CHALLENGE HE’S GOING TO HAVE NOW, IS HOW TO MANAGE ALL THAT MONEY HE’S GOING TO MAKE ON THE LECTURE CIRCUIT, ETC.. HOMBRE..EN SERIO? As opposed to “an Asian world”? As opposed to “a Black world”? As opposed to “a Chupacabra world”? As opposed to “an Extra-Terrestrial world”? Your racist veil has holes in it. hypnosided like prey by a cobra,millions of US citizens were misguided for the advantage of an useless political agenda.Still somes will argue that,as part of Obama legacy,we are enjoying “a peoples paradise” and wich is about to be destroy by president-elect Donal Trump. Regarding Puerto Rico,its people apawn by the patriotism of its great leader,Don Pedro Albuzus Campos,intellectuals,professionals,educators,working people,unions, religious leaders,honest politicians and the international community, propionate in Puerto Rico various significant defet : The liberation of Oscar Lopez,few days ago, and the expulsion of US military from Culebra y Viequez. This acts show us that colonialism in the island will never be legitimacy. A demand to repeal the Jones Act will help to polarized the colonial relations and an excelent national campaing to advance our cause by putting against the walls the yoke of US colonialism. If we don’t create a national and international political scenario Washington wont pay attention. The struggle continues. Oscar Lopez Rivera was always Free! He was always INNOCENT in the eyes of TRUTH! He was guilty, like Nelson Mandela, of being driven by The Occupiers and their Vende Patria Political implants to bring the light of crime into the open. That painful Light was too blinding for the Status Quo to bear so THEY had to act in the only way they knew how to assuage their sick idea of justice. Now after the Crucifixion, he’ll be ignored by the Bunchista, to prevent the Resurrection from coming to pass. Pues! Tiene gue ser asi. Simplemente, otra etapa de La Guerra contra todo Los Puertoriquenos. No matter what Obama would have tried to do, the Wicked Ones would have vetoed it, just as they were doing with all That this BLACK, Non-Citizen was attempting to give humanity. But he did the only thing he could at the time with the sons of the Partido de Sin Vergüenza. When they would not be able to find a way to stop it, he acted to do the right thing. Why granting bankrupcy chapter to PR if the island doesnt know how to vote for their governors. What was the purpose of letting that debt just go away so new politicians if u can call them that put the island in debt again in a matter of years? Sorry but no. And im puertorrican and i believe in PR being independent from USA. But majority of puertorricans (the ones that vote) unfortunately are ignorants and want to live at the expenses of the US nation and miserable contribution if u can call it like that, that the nation gives to PR. This year PR had the opportunity to make difference but no, the voted for Rosello and in 2nd place Bernier. So its always the same. Its a neverending story. So i agree for PR not getting granted under the bankrupcy chapter and that they make them pay what is owed. Its my opinion i dont need to get attacked. On the other side Oscar Lopez for me is a terrorist. Someone that participate on an attack and was witness of 3 or 4 people that die, is as guilty as the one that put the bombs. If he would have been a muslim would you defended him the same way? Im just saying. I understand so very well who Puerto Rico has meant nothing to the US ever … since the invasion! I was wondering if Obama would commute this sentence … Oscar Lopez Rivera is coming home! For that I’m very thankful .. yet, dark days are in and worse are coming to Puerto Rico. Let alone the whole world … with the ‘in-coming’ one! Por conspirarar contra Fidel lo condenaron a 2 cadenas perpetuas,no es comunista,por lo tanto no sera liberado. Couldn’t have said it better. And just to add, the President is a constitutional law scholar. Odd if he couldn’t point out at least three provisions of PROMESA that are illegal as applied to US citizens. Give credit to awesome statesmanship of a brilliant President that will be remembered for class. Dignity.magisterial persona grata. A blind man always expects for you to hold the door open and expects it. Yes, Puerto Rico is a colony. Like the wife who has an abusive husband she is expected by him to be happy when he is nice to her. I will say this…thanks for the release, now we wait your fate…as you will face your own challenges in a white world.